I couldn't find any reason to create an integration with Erebus. I know that, my problem is how Erebus adds it’s own ingots. How is it possible to allow Chisel to work with the blocks like it does in The Simple Life 2? I think they are asking for a way for metal blocks with Chisel variants to be still allowed/not unified. 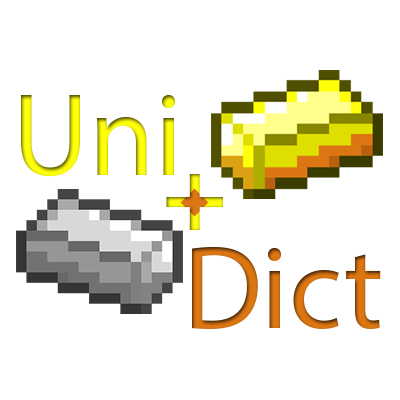 We can remove them from OreDict with the UniDict settings but it then makes it so Chisel doesn't accept them as viable option since it's coded around OreDict. Can you add primalcore support? Heyo, is it possible to let InstantUnify works with this state enabled? I tried here with the lastest UniDict version, and it is working fine. Howdy, can I be cheeky enough to request integration for Basic Nether Ores? If the items have differente sprites and I want to use the sprite from the equivalent item instead of the one being used, how would I go about doing that? it should work fine, thanks to OreDictionary. there is a config option called " B:enableSpecificEntrySort", enabling it will generate a .json that can be used to achieve what you want.